Better known as Involtini, these roll-ups combine spaghetti, tomatoes, mozzarella and eggplant in the most beautiful presentation ever. Not to mention also, the combination of Mediterranean flavors! First start by preparing a homemade tomato sauce. Saute the onion until soft and then add the garlic but do not let it brown. Add the crushed tomatoes, the tomato paste, pinch sugar, the water, the stock powder and bayleaf. Season and leave to simmer for about half an hour, stirring occasionally. Now slice the aubergine length-wise, into slices approximately a bit less than 1 cm. Take a grill pan, heat and add some olive oil. When the oil gets hot, grill the aubergine slices on both sides. Set aside. In the meantime you can boil the spaghetti just before it is al dente. It will continue to cook slightly in the oven or grill and besides you have to be careful as gluten free pasta tends to break easily if overcooked. When the pasta is ready, drain and put back in the pan. Mix in gently half of the tomato sauce and some chopped basil. Combine well until the spaghetti is coated with the sauce. Now you can either use a baking dish and put all the rolls together or else use individual oven proof plates. If you are using a dish, than put a thin layer of tomato sauce. You can now prepare the roll-ups one by one. Place an aubergine slice on your chopping board. Place a fork-full of strands of spaghetti on top. The spaghetti should stick out from both sides of the aubergines. 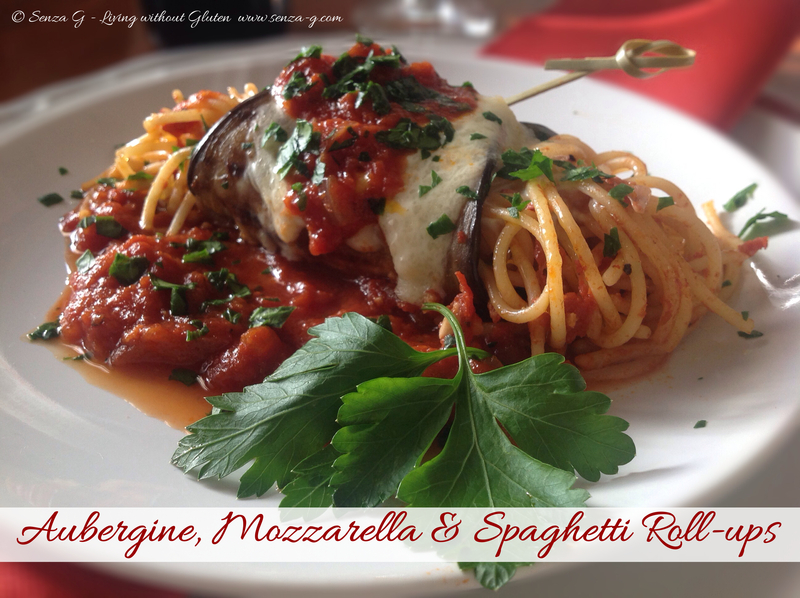 Add a slice of mozzarella on top of the spaghetti and then roll the ends of the aubergine over the cheese and pasta. Place another thin slice of mozzarella over the ‘fold’ and secure with a bamboo stick or toothpick. Place the rolls in the baking dish on top of the sauce. When you finish all the rolls, drizzle more sauce on top of each roll, sprinkle with more basil or parsley and some grated ricotta salata or Parmesan. Bake for approximately 15 minutes until the cheese starts melting. To serve, use a spatula so you do not break open the involtini when transferring from the baking dish to the plate. Or else, you can also do the same thing but as individual involtini on separate plates instead of a baking dish and use the grill instead of baking, until the cheese melts.